Although a tad narcissistic, my first foray into using Storify has resulted in a collection of stories of my own tweets from each session I attended at NLS7. I’ve done this mainly for my own record and reflection in years to come, as this was my first sustained effort at live-tweeting an entire conference and I want to be able to measure if my style or method changes for future conferences. I’ve been doing some reading on live-tweeting and reasons to do it. The Research Whisperer talks about the importance of ‘having a public record of what took place, from one person’s perspective‘. This makes sense to me, as this is exactly how I see my Storify collection. 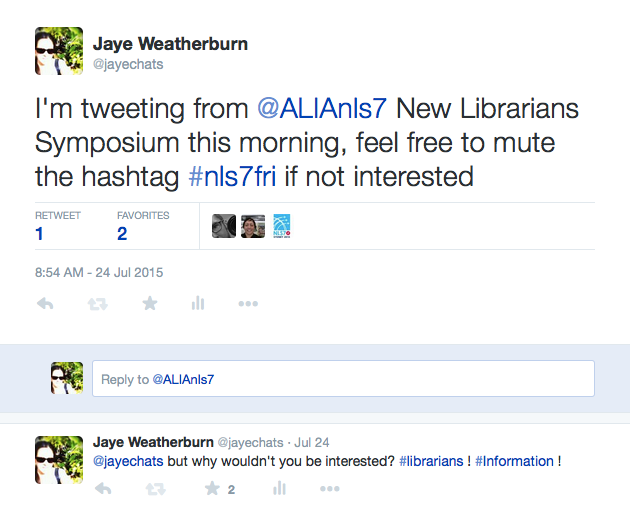 What I like about live-tweeting is the ability to take on the role of a ‘citizen reporter’ for events like NLS7. My main goal was to provide a ‘flavour’ of each session I went to for those unable to attend the symposium and who were following the tweet stream from afar, by tweeting key points from each speaker, and also noting any pithy points that resonated for me. What I continue to struggle with is the authenticity of live-tweeting, and not knowing whether a tweeter’s words are their own take on the situation or a direct copy of what they’re heaing. So when I live-tweet, am I putting my own spin on what I’m hearing, or am I typing quotes from the presenters verbatim, in order to best represent what the presenter intended? I suppose the more live-tweeting I do, the more I will cultivate my own voice, and those following along will in turn come to know this voice, and know what to expect. But what do I do about my continual fascination with playing devil’s advocate to explore many sides of an issue? By doing this, do I risk confusing people, or losing any trust that may be gained in my ability to correctly and without bias document events? The interesting question as to whether live-tweeting without permission is unethical is explored by The Contemplative Mammoth (why did I not think of such a title for my blog?) and the idea that ‘it should be taken as a given that a tweet is not necessarily an accurate representation of what was said’ is noted. This I think is a nice point that gives those newer to the experience of live-tweeting a bit more confidence to experiment while finding their style or ‘voice’ for live-tweeting. Contemplative Mammoth also put me on to the interesting article Let’s have a discussion about live-tweeting academic conferences which raises some good thoughts on misrepresentation and brings up the question: are conferences actually ‘public’? For me, live-tweeting at NLS7 was really an excellent way to connect with new peers in the industry, and to forge a Twitter Bond that will last long after the symposium, one that might even help assuage the #postconferenceblues that are in full swing. As well, I feel that live-tweeting will in future become a public note-taking device for me – one where immediate broadcast can share my findings with many, many others and invite comment, debate, and further discussion.